Superb contemporary style clubhouse with changing rooms, bar, restaurant, lounge and fully stocked pro shop. Golf facilities include comprehensive practice areas and equipment hire. PGA Golf Catalunya, consistently ranked as one of Europe's top golf destinations was the inspiration of Ryder Cup stars Neil Coles and Ángel Gallardo, a legend in Spanish golf. Their vision resulted in two courses – the Stadium Course and the Tour Course – that would provide the maximum level of enjoyment at every hole. The result is an architectural masterpiece of golf with fairways bordered by dense, mature forests, ever-present water and far-reaching views. 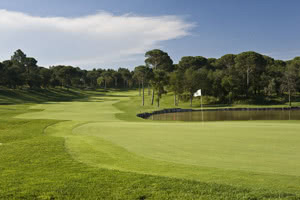 PGA Golf Catalunya opened in 1999 and has quickly gained an international reputation. It has been regularly ranked as one of the Top 10 European venues by ‘Golf World’ magazine and has hosted the Spanish Open and Sarazen World Open. The STADIUM COURSE at 6588 meters is a spectacular and imposing course which is consistently ranked among the best ten golf courses in Europe and was recently voted no.3 in Europe’s top 10 finest courses. The Stadium has been the venue for numerous PGA European Circuit tournaments and 2009 saw the return of the Spanish Open. The TOUR COURSE offers a slightly less stern challenge. Dominated by pine trees and lakes, the course is shorter and a little less difficult to play than the Stadium Course, yet the Ángel Gallardo and Neil Coles design ensures that it remains a challenge for every level of player. Most of the holes feature wide fairways and strategically placed bunkers which can be forgiving of a less than perfect shot. Another feature sure to focus the mind is that it seems you are never far from a water hazard. There is no question that the Tour Course is a worthy challenge, but if further proof were needed, it now hosts the PGA European Tour Qualifying School Final Stage.